NEW YORK, NEW YORK, UNITED STATES, June 26, 2017 /EINPresswire.com/ -- Recently there was a coup to remove the candidate who received the most votes among the Tamil NPC members, Chief Minister Vigneswaran. He was selected to be Chief Minister Candidate by all four Tamil parties: ITAK, EPRLF, PLOTE and TELO. Now ITAK is in a coalition with the Sinhala, Muslim and Sri Lankan para-military party to remove the Chief Minister Voigneswaran. ITAK should have consulted the other three TNA-coalition partners before attempting to remove the chief minister. ITAK, along with anti-Tamil parties, went to Sinhala governor to remove the Tamil Leader, who is beloved by 99% percent of the Tamil, Chief Minister Wigneswaran. This shows that TNA leader, Mr. Sampanthan, could not lead this TNA coalition and let the NPC members make their own coalition and made the Tamils angry. 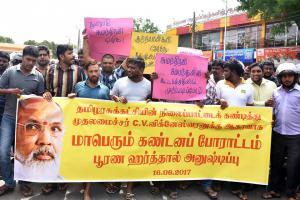 It was shown by thousands of Tamils who demonstrated to support the chief minister Vigneswaran. It further shows Mr. Sampanthan lost control of his party, and, therefore, he should think of resigning. We, the U.S. Tamils, suggest that the best way of finding out what is happening and who is behind this conspiracy is a formal and thorough investigation. Is it Ranil Wijeyaratne, Sarath Fonseka, Maithri Srisena, or the Sri Lankan government behind the NPC chaos? The Tamils need to know this. It is the only way to identify the treasonous Tamils among us. We need to identify the bad Tamils; otherwise Tamils will face consequences such as those Mr. Pirabaharan experienced due to treasonous Karuna. We, the U.S. Tamils, urge the TNA coalition partners to investigate this chaos that has been created by ITAK NPC members. Even if any of the partners refuses to investigate, the rest of the partners should initiate. The investigating body should be formed locally. The TNA should use non-political and experts who have conducted similar investigations. We suggest a person who has similar caliber to Jaffna High Court Judge Ilanchelian could be the right person to lead this investigative body. TNA should add four or two more investigators, so that any final decision can be definite and not hung. 1. NPC member Mr. Vinthan Kanagaratnam has reported to Tamil media that NPC members Arnold, Asmin, and Sayanthan have been plotting to remove the Chief Minister since January of this year. 2. Why did Sivananam, Arnold, Aswin and Sayanthan behave like an anti-Tamil members when they got signatures from Sinnahalease, Muslim and SL para-military group to remove the Chief Minister? Why did they not ask other Tamil NPC members? 3. What is the role of Mr. Sumanthiran MP and Mr. Senathirajah MP? 4. Why did Mr. Sumanthiran promote disunity among Tamils? a. Most of the Tamils believe a conspiracy to remove the Chief Minister was initiated by Sumanthiran. Sumanthiran wanted to bring disunity among the NPC members. c. Only Sumanthiran created the division among the TNA collision as some were armed groups and others were non-armed groups. d. Mr. Sumanthiran and his wife created chaos in the Uduvil Girl College. His underhanded action to remove the principal of the school made students to suffer without education and a highly-skilled head teacher (Principal) for a long time. e. Sumanthiran wanted to create chaos among the missing peoples’ parents. These parents had asked the SL government officials to kick him out the meeting when these parents had meetings at Temple Tree office. 5. Why did Sumanthiran travel alone to Geneva? a. He never advocated any thing to the Tamils, but always agreed to support the Sri Lankan government agenda. b. In New York in front of U.S. Ambassador to UN, Ms. Samantha Power and Mangala Samaraweera, Sumanthiran agreed to keep the SL army in northeast and agreed to the SL army retaining the Tamils’ land. He also agreed for local investigation of war crimes by Sri Lanka. 6. Who gave the millions of rupees to Mavai during the Presidential election? Was it Sumanthiran? Mr. Mavai Senathirajah distributed money to the TNA MPs. Where did he get it? Did Sumanthiran give it to him? If so, who gave the money to Sumanthiran? Did Sumanthiran compromise the Tamils aspiration for money? This has to be investigated. 7. Sumanthiran received money from Canada and the UK. He should report to TNA and show the accounts to the TNA. He may be corrupt. It is best to look into his corruption. It is important Tamils need a non-corrupt politician to work on behalf of Tamils. No one should take advantage of suffering Tamils. It should be investigated. 8. Why did Sumanthiran lecture for a demerger of the northeast? Did he compromise with Aswin and Mr. Mohamad, who was the assistant Election Commissioner who came to Jaffna and stayed over to watch the ballots counting. There were some media reports that Mr. Mohamad made changes in tally counting to make Sumanthiran to win the election. Therefore, Sumanthiran compromised his win to demerger, so that Aswin and Mohamad friends can control the eastern province instead of the Tamils. It should be look into in detail. 9. Why did Sumanthiran did not ask for federal arrangements for the Tamils political solution? 10. Why did Mr. Sumanthiran gave false promises during the election through his own-making election manifesto? 11. Sumanthiran says “What happened in Mullivaikkal is not a genocide.” This need investigation.